Too hot? Too cold? 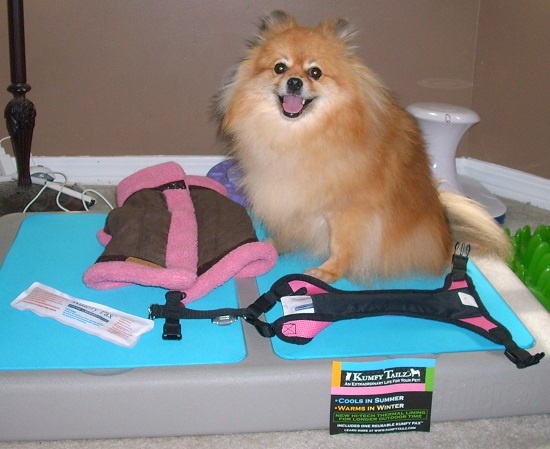 Kumfy Tailz has you covered! 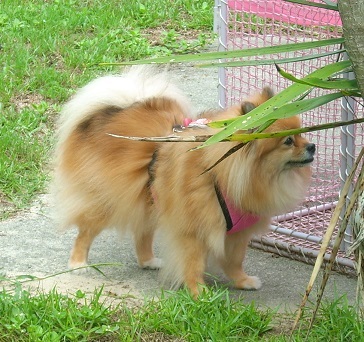 I am always hot, so I will use the Kumfy Tailz Mesh harness to stay cool on Summer outings! Plus, Kumfy Tailz has the warmest dog coat I've ever felt. It will be pawfect for Northern Winter adventures! 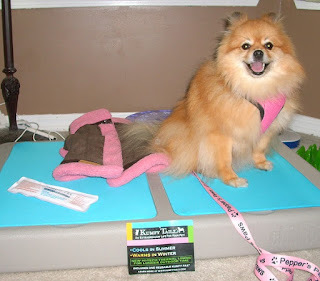 The harness can be used for both warming and cooling, the coat is designed for maximum warmth. 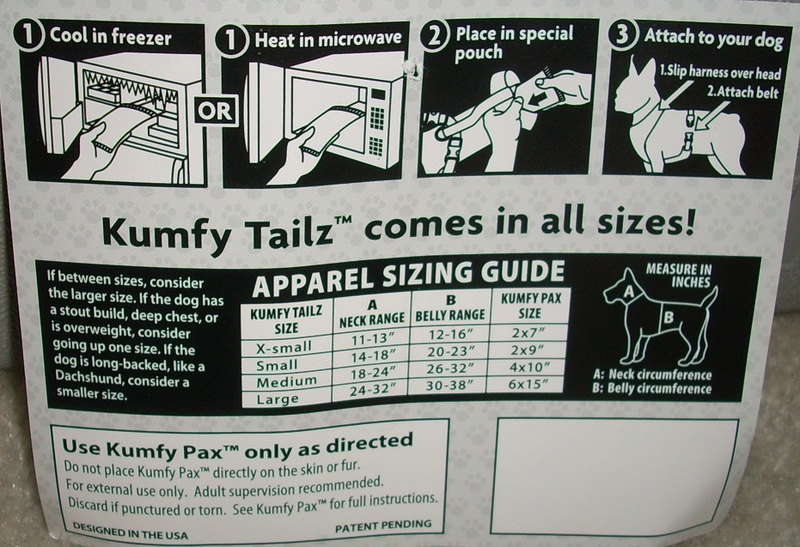 Let's bark about what makes Kumfy Tailz so special. First is the design. Kumfy Tailz covers your body core instead of your back. Our core is the most efficient place to control our temperature. 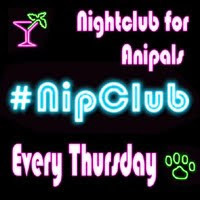 It has something to do with our blood temperature, and the thinness of our skin & fur in that area. 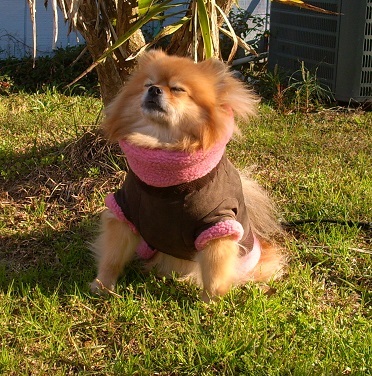 Kumfy Tailz is also designed not to put any pressure on our trachea. 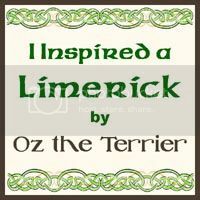 Little dogs with a collapsing or weak trachea know how impawtant that is. Since there is no pressure on my throat, I can wear the Kumfy Tailz harness in the car. My Tagg Tracker fits on the back strap of my Kumfy Tailz Harness. Second is the Kumfy Pax. The Kumfy Pax is a soft gel pack that you can freeze or warm up. You can put a frozen Kumfy Pax inside the harness pocket to help you stay cool. You can put a warm one in the coat (or harness) pocket to warm you up. The pocket for the Kumfy Pax is insulated to help it stay cool or warm longer. The pocket is also waterproof so that you won't get a wet chest from condensation. BOL! 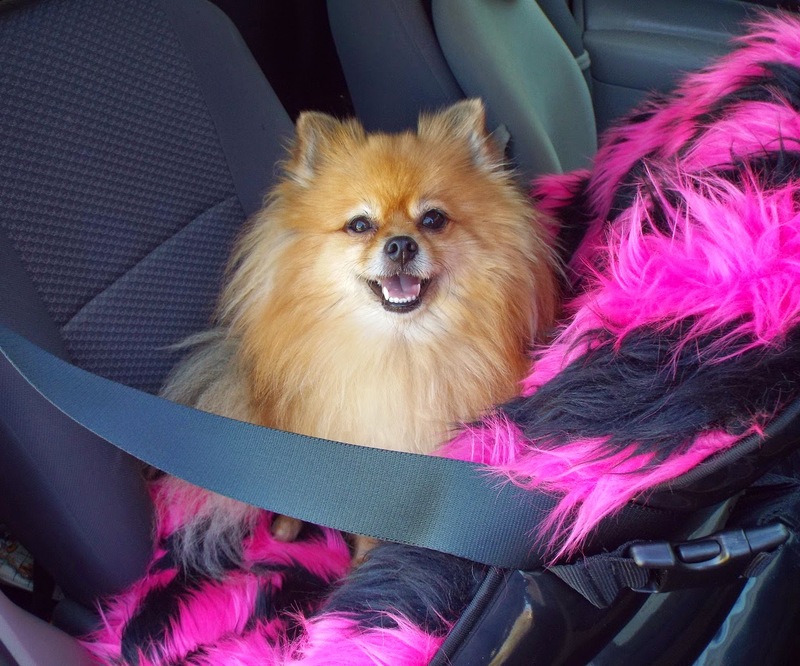 A Kumfy Pax is included with each Kumfy Tailz harness or coat. It is over 80 degrees outside and I am not panting. The cold Kumfy Pax feels great! Since it is Summer in the South this month, I will bark about the mesh harness first! It is hard for me to stay cool in Summer because I have a heavy double coat and live in the South. I have tried a lot of ways to stay cool. I have tried every cooling product I can get my paws on. BOL!! I must say that the Kumfy Tailz mesh harness with a frozen Kumfy Pax is the most comfortable cooling vest/harness for dogs that I have found. The soft gel Kumfy Pax feels much better than a hard cold pack. It may not stay cold for as long as a hard cold pack, but it feels much better. Pawsonally, I prefer a comfortable soft cold pack instead of a hard one. I can order extra Kumfy Pax to keep in the freezer for when I will be outside longer than one will stay cold. I would pack them in an ice-chest for all day adventures. The Kumfy Tailz harness is a little longer than a regular harness so that it can cover more of your body core. You use belly size instead of standard girth size to find your size. The sizing chart shows you where to measure for the best fit. (Mine fits a little further back than normal because I am between sizes. I always fall between sizes, and then go up a size to make sure it will fit my large chest. Most dogs are easier to fit than I am.) 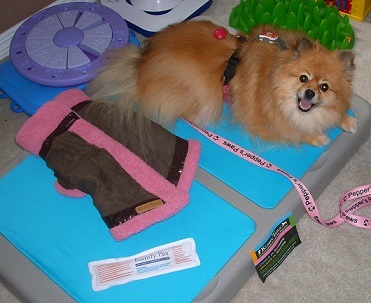 The Kumfy Tailz harness is available in 4 colors: black, red, blue, and pink. Naturally, I chose pink! I will stay warm next Winter, even if we find snow! 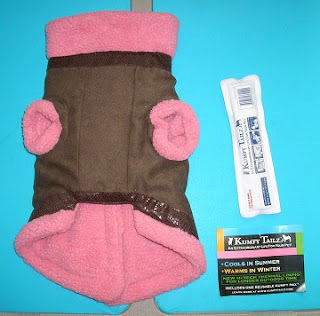 Unlike most dog coats that only have a strap around the neck and belly, the Kumfy Tailz coat has a solid front that covers your core. It fastens closed on the back. The Warming Winter Coat is available in 3 colors: brown/brown, brown/blue, and brown/pink. Of course I chose a pink coat! BOL!! Like the harness, the coat also has an insulated pocket for a warm or cold Kumfy Pax. I can't imagine a warmer dog coat than this one. It covers your core with warm fleece, and you can put a warm Kumfy Pax in the pocket! The coat is available in 3 sizes: extra small, small, and medium. I have a size small, the same size as my harness. It is a little snug in the chest, maybe I should have chosen a medium - I forgot to allow extra room for the thick fur of my Pomeranian neck ruff. It is so hard to fit a large extra furry chest. BOL!! The collar can be folded down or left standing up to keep the throat warm. My Warming Winter Coat photos were taken in February during one of our last cold spells. 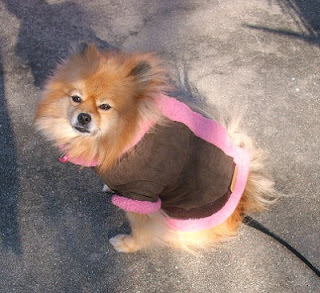 We had temperatures in the 30s, Mom does not put a coat on me in hot weather. 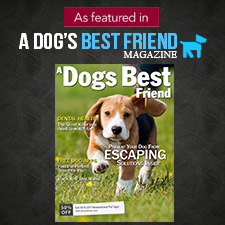 My pal Lulu at Life With Beagle is giving away a Kumfy Tailz Mesh Harness! If you want to try to win one, please visit her blog to enter. Thanks a bunch for that, Pep!! 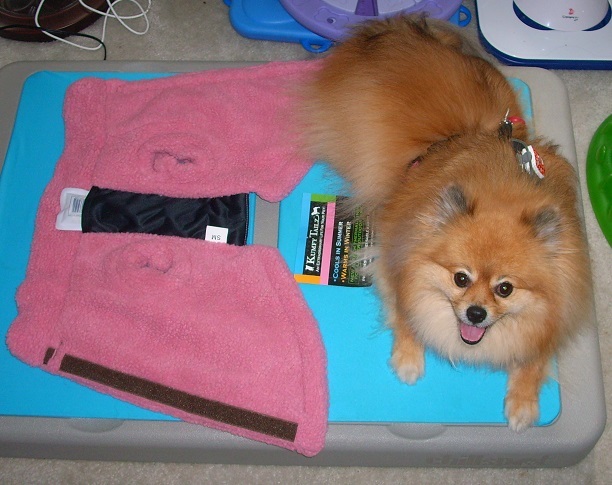 What a pawsome product and review, Pepper! I like the fact it does not put pressure on your delicate trachea and does not drip all over the place from condensation, too. You look like a model in your harness and coat. The pink is definitely your color! Great review, you look adorable!! Pepper you are such a beautiful model!! I gotta get me one of these!! It sure looks like it would not only be comfy, butts not as restricting as some other coolin' vests I've seen! Thanks for the review! HI!, Thanks for the awesome review. Just love seeing Pepper looking into the sun in some of these pics. What a model! Hope to see you at Superzoo! How cute these are! And whenever we leave the Bay Area for the south of the state, Huffle gets far too hot so he would love some way to help keep him cool. Bought one from Baxterboo.com after reading your review. Everything is 40% off until the 4th of July so it was no more than a regular harness and when not in use, I can use the cold pack in a scarf wrapped around the back of my neck when I mow the yard to keep me cool. Thanks for the great review! Nesbitty hasn't panted once in the hot Florida sun since we bought it!